The unique technology Dr. Desikan Sundararajan researched and developed while obtaining his doctorate at The University of Toledo College of Engineering led to a job offer prior to graduation and a patent-pending system that could help nearly eliminate harmful emissions at manufacturing facilities. 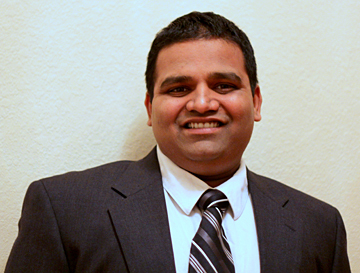 Sundarajan, who received his PhD in chemical engineering in 2009 under the supervision of Dr. Abdul-Majeed Azad, is now a research and development manager at Green Systems (formerly a division of Total Compliance, now a division of Resource One), which is the company that offered him the job before he defended his doctoral thesis. While at UT, Sundararajan and Azad, UT professor of chemical engineering, developed a unique control system to limit the emissions of carbon monoxide (CO) and volatile organic compounds (VOC) from automotive and industrial exhaust streams. The system, which reduces harmful emissions by more than 90 percent, is similar to how a catalytic converter works in automobiles with a catalyst that stimulates a chemical reaction to change the harmful carbon monoxide generated by the test engine into carbon dioxide. Green Systems is working with several automobile companies to use the emissions control system developed by Dr. Desikan Sundararajan and Dr. Abdul-Majeed Azad. But what is unique about their CO and VOC unit is that it uses a mixture of several metal oxides rather than precious metals as do most catalysts, and that significantly reduces the cost. In the process, it does not require natural gas like other thermal oxidizers/incinerators but only the heat of the exhaust itself, which means very low energy consumption. “We are proud we were able to develop this system that not only greatly reduces emissions, more than 99 percent in some cases, but it also uses significantly less energy itself so it’s green on several levels,” Sundararajan said. It was Total Compliance, an environmental consulting business based in Cincinnati, that first came to Azad in 2007 to seek an answer to the problem of controlling emissions in a manufacturing setting. The design developed by Sundararajan and Azad initially went through several iterations of more than 10 catalysts before the researchers found the best one. It was first tested on a small scale in the College of Engineering laboratories and was later scaled up and perfected for long-term use. The University has a provisional patent and a patent pending on the technology, and Green Systems has a license and commercialization agreement. 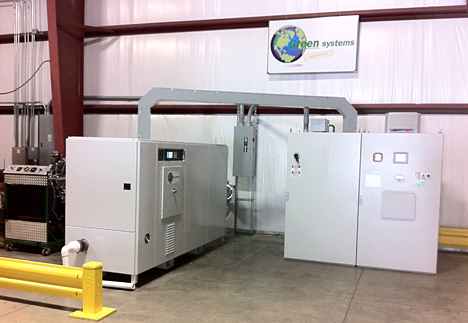 Green Systems is working with several leading automobile companies to use the system in its engine testing facilities, but it also can be marketed for paint booths, printing operations and a variety of other industrial processes that emit carbon monoxide and volatile organic compounds. The CO and VOC unit was designed and engineered in Ohio and it is also manufactured in the state. Green Systems has worked with northwest Ohio companies on fabrication of the demo and plans to continue to work with state businesses for the manufacturing of the commercial models. This entry was posted on Friday, September 2nd, 2011 at 4:50 am and is filed under Research, UToday .